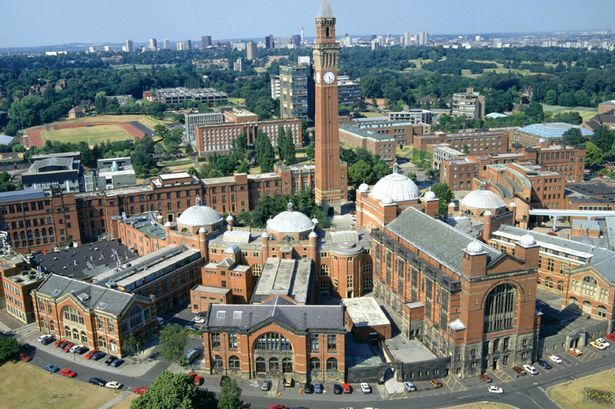 More than 100 University of Birmingham academics and support staff have been placed at risk of redundancy - including "high-calibre" scientists who have brought in millions of pounds of grant money. A total of 49 staff at the neuroscience and pharmacology department in the medical school and 59 engineering staff are at risk in the university&apos;s largest job loss programmes for years. The university said the cuts were part of wider changes to focus investment on key growth areas. The Birmingham branch of University and College Union (BUCU) claims staff posts are being removed at a time when average annual salaries of senior academic managerial staff are £154,000, compared to the UK figure of £79,000. BUCU has now passed a branch resolution considering industrial action if compulsory redundancies are not avoided. A BUCU source said: "The university has announced to disinvest in neuroscience and pharmacology in the medical school in March 2015 by putting 49 staff - 42 academics and seven support staff - at risk of redundancy. "One of the reasons given for this step was a very ambiguous heat map analysis primarily based on external grant income and the group at risk has been unfairly accused by the university not to have performed adequately. "The members of staff placed at risk of redundancy, however, contributed substantially to teaching, have brought in more than £8 million grant money and have published more than 350 research papers over the last five years. "We are at a loss to understand how this can be seen as inadequate performance. This creates an atmosphere of fear as no-one can feel their jobs are safe any more. "Consultation with staff and trade unions has taken place and several counterproposals that would have allowed full avoidance of compulsory redundancies have been submitted by affected staff and BUCU. "The university has revised their initial proposal and slightly increased the number of future posts but is still suggesting compulsory redundancies." The union source said a BUCU request to drop the redundancies had been rejected by the university. "BUCU has passed a branch resolution to consider industrial action if compulsory redundancies are not avoided," he added. "BUCU has submitted a counter-proposal that would have allowed full avoidance of compulsory redundancies; this counterproposal was not considered by the university. "In April 2015, BUCU had asked whether there will be any further suggestions for large scale redundancies. The university responded with an unambiguous no to this question. "On June 1, however, the university announced a reorganisation in Engineering that puts further 59 members of staff at risk of redundancy. "The major reasons given by the university are financial implications - reduced government funding, disinvestment in all but three research areas, and re-organisation of engineering teaching. "BUCU has informed the university that we do not believe that this is a genuine case of redundancy." The union source said staff under threat were at increasing risk from stress. "Members of staff report high stress levels. We have noted a high number of sick leaves and complaints about too high workloads and stress at work from our members," he said. "BUCU is very concerned about the health and well-being of staff. The reduction of posts suggests that the workload for remaining staff will significantly increase. "BUCU is very concerned about the future quality of teaching as some teaching will have to be delivered by non-specialists. Concerns have also been raised by the student reps and the Guild of Students to our knowledge. "All of this is happening while the university spends more than £300 million on new buildings and modernisations and while the university makes a substantial surplus every year. "Staff posts are removed while the university pays their &apos;senior academic managerial staff&apos; average annual salaries of £154,000, as compared to the UK average of £79,000. This is a scandal in our view." A university spokesperson said she anticipated the actual number of redundancies would be "very small". She added: "As a forward thinking institution that strives to be at the helm of research excellence, innovative teaching and the very best student experience we must continually evolve to meet the needs of our staff, students and partners. "Life sciences and engineering are priority areas for the university and the proposed changes will ensure investment is targeted in these key areas of research excellence. "We are committed to providing the highest standards of teaching, supporting ground breaking research and enhancing the student experience. "We take our responsibility as an employer extremely seriously and our staff have been, and will continue to be, fully consulted during this process."